Buy Just Natural Organic Raisins 500g in the UK from our online shop or directly from our independent Scottish store. Use organic raisins in your breakfast, baking or as a healthy snack. This chutney goes well with Indian foods, like curries, dahl or cheese. I made this chutney last year and it tastes great, even if I say so myself! What’s even better is that it’s a great way of using up any green tomatoes! This recipe contains 100g organic raisins. Soya contains isoflavones which can help with menopausal symptoms, like hot flushes and mood swings. The essential fatty acids in the seeds can help with stiffness in the joints as well as brittle nails and hair. Pumpkin seeds are high in zinc and sesame seeds are high in calcium - so as well as being delicious it is a very healthy cake, too! This recipe contains 200g raisins. Cauliflower should be available from mid to late April. You can use dried or tinned chickpeas. Add extra time when using dried chickpeas. This recipe contains 75g raisins. Another dish which uses sauerkraut. Sauerkraut can be eaten year round, but is more of a winter vegetable as it is preserved white cabbage. This recipe contains 50 g raisins. Oliebollen are normally made with milk, egg and wheat flour, but this recipe uses milk alternatives and no egg. So suitable for vegans. This recipe contains 50 gram raisins. We sell real Just Natural and other Dried Fruits directly from our shop in Scotland and online throughout the UK. Where can you buy real Raisins 500g - Organic safely online? If you are wondering where you can buy Just Natural Organic Raisins 500g safely online in the UK, then shop with us. We are an actual health foods shop; with real people selling real foods and products. Our award-winning independent shop is located in Stirling, Scotland since 1976. You can buy our Dried Fruits in store or safely place an order with us online or over the phone. 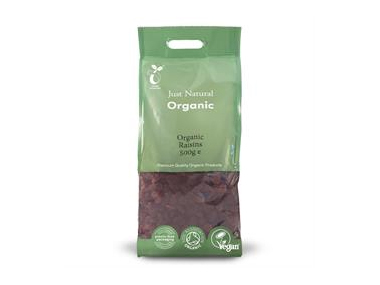 Raisins 500g - Organic - Just Natural Organic Raisins 500g in Dried Fruits and Foods.